With instant coupon at McAfee.com. McAfee Antivirus 2015 has just been released! 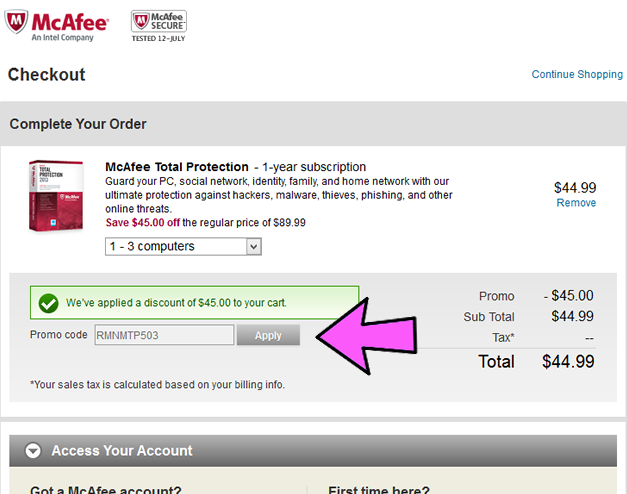 And now you can head on over to McAfee.com directly and save 50% with our instant coupon code. That drops the price down from $49.99 to just $24.99 per license. Just follow the link above and you’ll have the option to get any of the other three top selling 2015 computer protection versions from McAfee (no need to enter any codes at checkout as this discount will be automatically applied for you). 2015 Versions on Clearance at Amazon. Antivirus software seems to have become a commodity in the last few years with all of the top brands trying to out-price each other (good for us consumers looking for a good deal!). This week, Amazon has the best deal with the three-user version of AntiVirus Plus 2015 for under $20.00 for a full year of protection, saving you upwards of 65% off the retail price. If you are a Prime member shipping is included for free. Otherwise, you’ll need to buy something else to meet to $35.00 minimum free shipping threshold or pay about $5.00 for standard shipping. Prices subject to change and can sell out without notice. If your current McAfee subscription is about to expire, then you may qualify for the renewal discount of $30.00, dripping the price down to $39.99. However, the renewal discount is only available to those that are “manually” renewing their license as the auto-renewal price (if selected in the settings) will renewal your subscription at the retail price. We don’t recommend taking advantage of this offer as you can get a much better price buying a new license. At Staples & select stores. If you need the physical disk today and don’t want to wait for the installation CD to arrive in the mail, then you can usually find McAfee AntiVirus Plus sold at your local Staples store. But before you run in to get it, make sure you mark down the sales price at Amazon or one of the other top online sellers (it just must be “shipped and sold” by them) as Staples will price match the identical version to most of the top competitors. McAfee is free for the Military! There are a number of different military discounts out there but this one has to be one of our favorites. If you are currently in active military service then you’ll be able to get a 2-year subscription to McAfee Internet Security 2015 for free. That’s nearly a $100.00 value and it doesn’t cost you a dime. We’ve put together a full article that details the instructions and steps required to be able to receive the free installation key. An ongoing offer for active military personal. Download and try at McAfee.com. If you are considering McAfee AntiVirus 2015 but have not yet tried it out before, then you can get a 30-day subscription free to try out. McAfee will require you to create a free account, just be sure to de-select the email options unless you want to receive marketing communications from them. After 30 days, you will need to purchase the annual license if you decide to continue service with them. 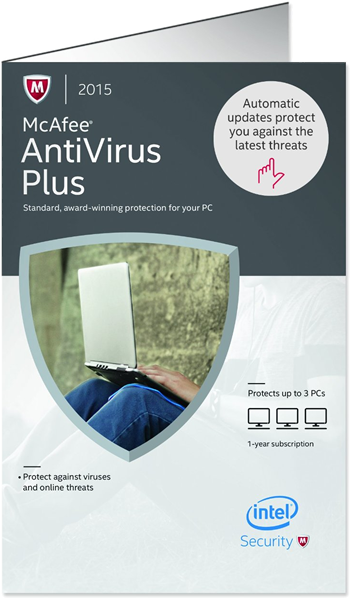 How do I use a McAfee Antivirus coupon? 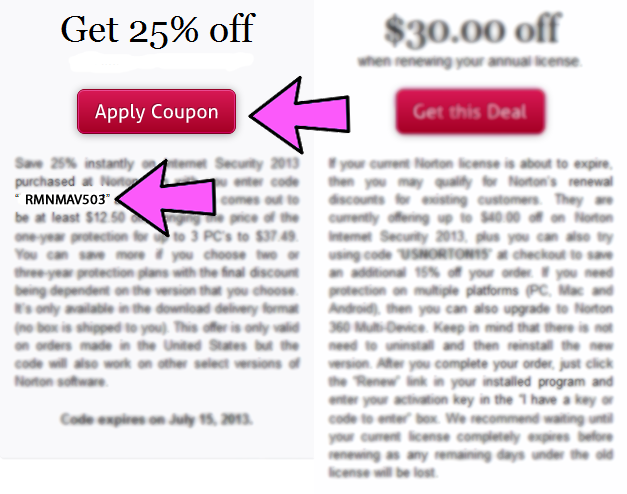 There are several types of deals that we track here on Software Voucher for Antivirus Plus 2015. You’ll see that some promotions don’t require you to use any code at checkout, but rather, it will already be on sale, only available for a select group of pre-qualified customers (like students or those upgrading), and some offers automatically applied with you follow the provided link. Whenever we list that a coupon code is needed, simply follow these steps to be sure that you’re taking full advantage of the deal. Step 1: When the offer says that you have to enter a promo code at checkout, be sure to right-click and copy the code exactly how it appears (excluding the quotation marks). Be sure to keep all letters and/or numbers intact without selecting any blank spaces or changing any of the capital letters. Step 2: Click on the “apply code” link listed next to the description. This will take you directly to the store that where the promo code is accepted at. Often this will be an official McAfee promo code that only works on orders made at McAfee.com and other times it will be a code that is given to us from an authorized reseller. Because the coupon will only work at the store listed, it’s critical that you follow the provided link to go to the proper store. 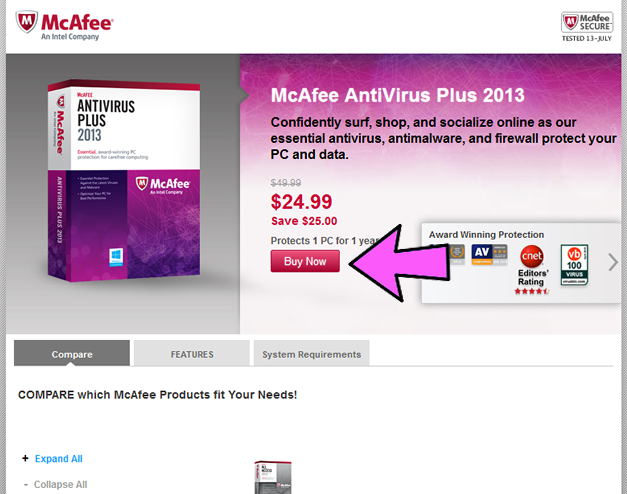 Step 3: Once you reach the store (in this example it’s at McAfee.com), there will be a “buy now” button. Follow this link and it will add a copy of Antivirus Plus 2015 into your cart. Step 4: This is the page that you will enter the code that you copied in Step 1. Find the appropriate box, paste in the offer code, and click “apply”. If successful, you will see a green confirmation message box indicating the discount that you will be receiving. If for some reason you receive an error message, we recommend that you verify the promo code and try again. If it still does not work, please email us and we will help you trouble shoot the issue. When will McAfee 2016 software be available? McAfee typically releases their 2016 versions in early September. 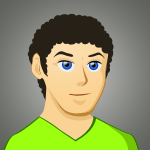 We are monitoring the latest developments, expected new features and beta news. We will be posting the new promotions as soon as they become available.